Theronai warrior Torr has never forgotten Grace, the human who stole his heart and nearly gave her life to save his. So when he is summoned to the aid of Brenya, the powerful woman who healed Grace, he is devastated to find that Grace’s cure has left her mind devoid of any memory of Torr or their love. Since launching her career in 2007, Shannon K. Butcher has penned more than eighteen titles. 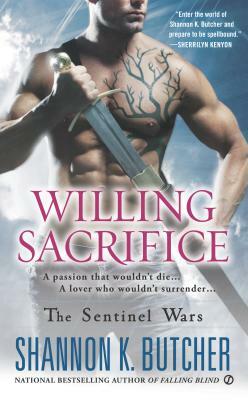 Willing Sacrifice is the eighth in the paranormal romance series the Sentinel Wars, following Burning Alive, Finding the Lost, Running Scared, Living Nightmare, Blood Hunt, Bound by Vengeance, Dying Wish, and Falling Blind. She is also the author of the action-romance series the Edge, including the novels Living on the Edge, Razor's Edge and Edge of Sanity, and a handful of romantic-suspense novels and works of short fiction. Being a former engineer and current nerd, she frequently uses charts, graphs, and tables to aid her in the mechanics of story design and to keep track of all those pesky characters and magical powers. An avid beader and glass artist, she spends her free time making jewelry she often gives away in contests on her website.